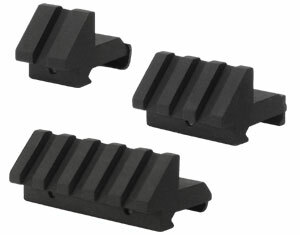 These mounts are great when used with scopes, flashlights, lasers etc. Accessories are mounted at a 45 degree angle. When used with scopes the iron sights remain visible. Made from aircraft quality aluminum and hardcoated to Mil. Specs. Available in one slot, 3 slot, and 5 slot configurations. Uses a 7/64" Allen wrench.